0 Members and 1 Guest are viewing this topic. Read 1385 times. I use a pair of King 60V Maraschinos to drive my subwoofer system. I have an infinite baffle subwoofer system with four Acoustic Elegance IB15HT drivers in each manifold. I have two manifolds for a total of 8 drivers. The manifolds are mounted under the floor and slightly outside and behind my mains (GR-Research LS6's). The sound and feel of this in the room is incredible. That low 7 Hz tone provides a very powerful shake. I decided to push the amps even further. For the past week I used just one amp with 8 drivers wired in parallel for a .8125 ohm load at 7 Hz. The Maraschino handled it just fine. Recently I had a chance to use the amp with a Stereo Integrity HS24-D2 subwoofer driver in a 15 cubic foot box. We played a bunch of infrasonic content from movies. 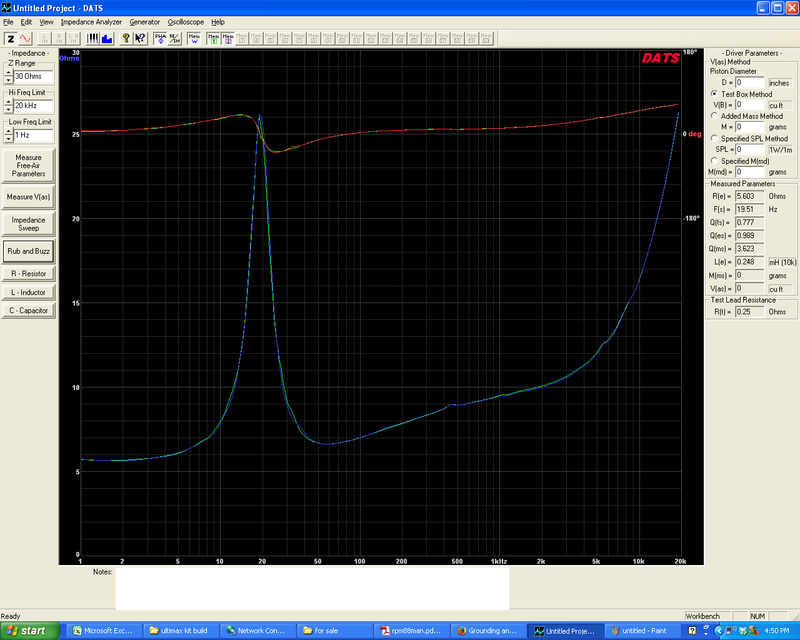 Recent measurements show this driver to have the lowest infrasonic distortion of any driver tested so far. Large drivers will typically have better bass because the driver doesn't have to move as far for a given SPL and can return to stop quicker. Multiple small drivers can match the output levels, but not the low distortion. The Maraschino had great control over the 24" driver and was able to produce tremendous infrasonic output. In fact, the owner of the driver said the Maraschino was putting out as much infrasonic voltage as his bridged Behringer EP4000. The Maraschino, though, was completely passive and running cool during playback. What kind of measurement software are you using to analyze the acoustic output in the room. Also what software are you using to analyze the music file? My playback chain is HTPC > MOTU 1248 > amps. The MOTU 1248 is DC coupled so the output is flat to 0 Hz. The mic input on the MOTU 1248 is -2.5 dB at 3 Hz. I use JRiver Media Center for playback and use the free Voxengo SPAN VST plugin within JRiver for the analysis of the actual music. Thanks, I saw a couple things I didn't recognize. I use REW and a Cross Spectrum Labs sourced Dayton UMM-6. I haven't added Thiele-Small driver measurement software yet. I am afraid I have to be content with a 3dB down point of 16Hz in my room. The Voxengo SPAN software looks pretty interesting. I have been using the freeware Audacity, for analysis of music files. Most pop music is pretty sad looking. Great thread! Thanks for starting it. The Maraschino is DC coupled end-to-end with isloated lock to the preamp (or D/A) GND ---- it can actually be used as a very quiet DC power supply, and since it's "true-differential", it can output positive or negative voltage too.